This book in #13 in a series of 32 Dark Shadows novels. By this time, author Dan ("Marilyn") Ross has established his own tried-and-true formula. The stories all follow pretty much the same pattern:(1) The heroine arrives at, or is already living at, Collinwood. (2) The heroine falls in love with Barnabas Collins, not realizing that he's a vampire. (3) The heroine finds herself endangered by some natural or supernatural threat. (4) Barnabas saves the day. (5) The heroine guesses or suspects that he's a vampire but still wants him anyway. Barnabas, however, chooses to depart rather than involve her in his cursed existence. The girl is sad. BARNABAS COLLINS AND THE MYSTERIOUS GHOST follows this formula. The heroine is ballerina Diana Sampson, who arrives at present-day Collinwood to perform at a show in Collinwood's "haunted" chapel. Someone begins making attacks on Diana's life. She can't decide whether it's a supernatural threat or a living person. She falls in love with Barnabas and being smarter than Maggie Evans----Maggie, after all this time, still hasn't caught a clue!---figures out almost immediately that he's a vampire. But Diana still wants him anyway...And so on and so forth. The formula is beginning to wear a little thin. However in the next book---BARNABAS COLLINS AND QUENTIN'S DEMON---Ross will try something new, thank God, and restore my faith in the series. Back in the day, Dark Shadows gothic phrases like "...and I can hear the soft whispers and the furtive footsteps in every dark corner..." would have my little teenage heart aflutter. However, those days are long gone and while I do appreciate the descriptive language in this book, I found the story to be just OK and pretty formulaic at this point in the DS book series universe.For all intents and purposes, the story could have been about any people, not those exclusively at Collinwood. The only ties are those of visitors to the estate and the heroine falling in love with Barnabas each and every time in the story and remarking on his cold, cold lips. Aside from that, the main story usually takes place about characters not introduced into the DS soap opera. While I appreciate the author's efforts to keep the franchise saturated with all things DS, I found myself disappointed in this effort.I did get a mention of Amy, however, and I believe this was the first one. But that was all it was, a mention. No story around her or David or Maggie.Not only that, Quentin, who is pictured on the book cover, is not in the story. That is either a brilliant marketing strategy or lazy graphic artists. I'll continue with the series - why not, I have all the books, but the remaining will be read with alot of distance between each. ere's another instance in this series where the cover photo is inaccurate. In this case it shows both Barnabas and Quentin, yet Quentin is not anywhere in the book. 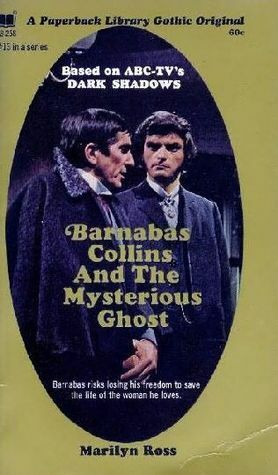 In a number of the early books it shows Barnabas on the cover but he hadn't yet appeared in the storyline. Someone was sort of sloppy in their work in my opinion.The story involves a ballet troupe that has come to Collinwood. Elizabeth is allowing them to set up on the grounds. Diana is one of the members of the troupe. Maggie Evans is now the governess. Barnabas is at the Old House and has a servant named Hare.It's apparent that the ballet group has a lot of internal problems. Barnabas tells Diane about the legend of the double suicide at the chapel and widow's peak. Diana ends up getting attacked quite a few times in the book. Other people end up being killed, and Diana ends up falling for Barnabas.The police chief and many of the townspeople think Barnabas is behind all of the trouble. There also may be a thug walking around attacking people. It's a rather complicated story, but another good one in this series. Marilyn Ross's books have been a favorite since my childhood. Despite the obvious literary limitations of the author, there's nothing quite so gothic as curling up with a Dark Shadows novel in the long nights of late winter. Period pieces with somewhat Scooby-Dooish endings, these books never fail to please me. Barnabas Collins is one of the most successful vampire prototypes ever. Don't know that I can take many more of these. So formulaic. I think Quentin comes into the next one so that will mix it up a little.